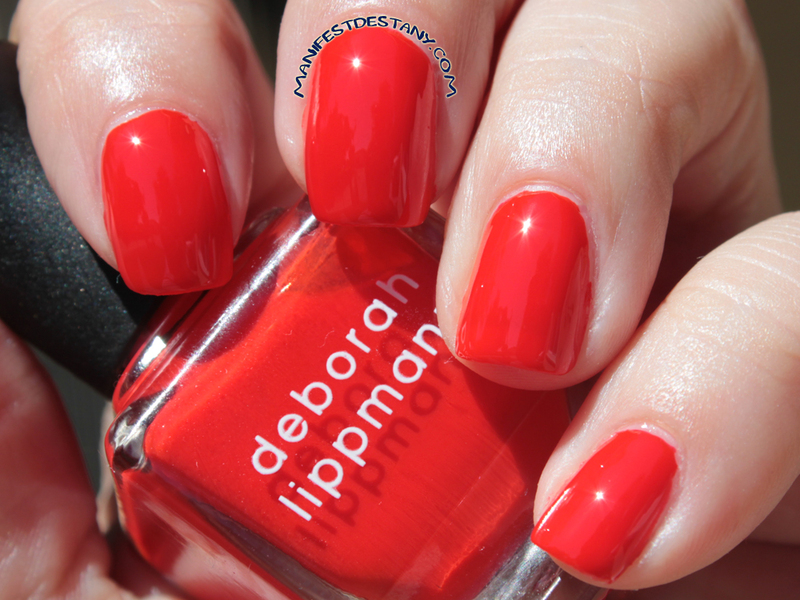 The one with Deborah Lippmann Footloose! Good morning! Have a look around at the new blog! I had it revamped and this layout made it's debut last night! What do you think of it? Additionally, do you have Pinterest? Could you do me a solid and follow this board? There's a contest going on, and the more people who follow that board for me, the better! It's finally started to cool off here, and we've had sun, so that makes for some photos with great lighting! Personally, I take photos best in natural sunlight, so for me, it's been a great past couple of days :) Today I have a gorgeous bright red creme to show you, Deborah Lippmann Footloose! I used three coats just to ensure that I have no VNL, but the formula on this is just fantastic. The color really pops! At first, I was completely unsure about Deborah Lippmann's cream polishes. The first one I tried I was not crazy about. But as time has progressed, and I've tried more of them, I'm finding that I really like some of them! I managed to snag this one from Copious. In honor of my new layout, I will be launching a smallish giveaway later this afternoon! There will be four winners!